The hardest safe to break into is the one that no one knows is there. 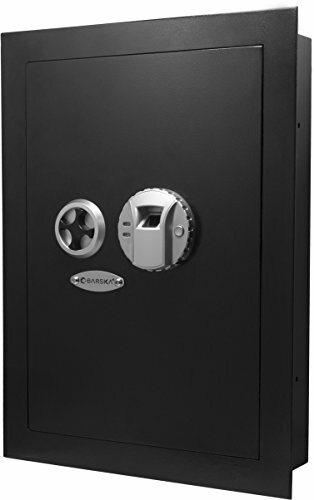 This safe is for any home or business because it can easily be concealed behind pictures, mirrors or behind furniture. With the main body of the safe inside the wall the door allows it to sit flush against the wall, providing ultimate concealment. An emergency override key enables you to open the safe even without entering the combination. Two removable shelves allow you to organize valuable items such as medicines, jewelry and important documents. The safe's biometric technology gives you the ability to quickly and effortlessly access your weapons in the time of an emergency. It also offers a manual two point solid dead bolt locking system that can be quickly opened. 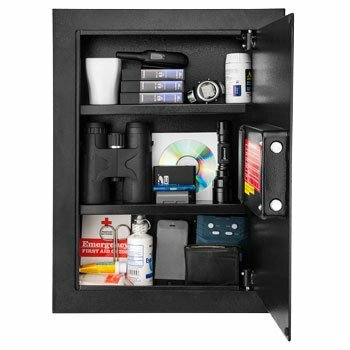 With your purchase, you will receive the wall safe, a set of emergency back-up keys, a protective floor mat, and mounting hardware. Factory pre-drilled anchor points allow you to permanently secure the safe to the floor or wall with the included mounting hardware. It's powered by four AA batteries (included), which can last for up to 2 years.